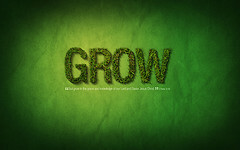 We began a new life in Christ for the purpose of growing in our relationship with Him. We don't simply pray a prayer for fire insurance and then remain the same. The Lord wants us to mature in our faith and walk with Him. In the above passage of Scripture, Peter gives us eight steps for believers to mature in their relationship with God. Faith. Our faith in God is the foundation, the starting point for our spiritual growth. When we have faith in God, we have the conviction that He exists and that He alone is the Creator and ruler of all things. We believe that salvation comes only through the death, burial, and resurrection of His Son, Jesus Christ. Goodness. Once our faith has been firmly established, we should add goodness as the second step. Goodness is defined as virtue or moral excellence. We should have the desire to live out lives that are pleasing to God. Knowledge. The third step is knowledge. We need to study the Bible. We need to be involved with a local body of believers where we are learning more about Him in corporate worship and small group Bible studies. In order to become more like Him, we need to know Him in a deeper way. God's Word is our instruction manual. Self-Control. In today's world, self-control is hard! But in this passage, Peter clearly states that once we have a firm knowledge of God's Word, we need to add self-control as the next step. When you have a control of self, you are able to master your desires and passions, especially in the area of our sensual appetites. Endurance. In this next step, we move up to endurance. In the New Testament, this has been typically defined as not swerving from our spiritual purpose and loyalty to the faith, even in the middle of severe trials and suffering. As we patiently continue our spiritual journey through difficulty times, the Lord is able to mature us for what He has called us to accomplish for His Kingdom. Godliness. Holiness is the sixth step in our spiritual growth. We should desire to live Godly lives that are set apart for His purpose. Every day, we have a longing to become more and more like Him. Brotherly Affection. As members of the Body of Christ, we should love one another. The meaning of the Greek word used here is the same as the city of Philadelphia or "city of brotherly love." This is a New Testament type of love where Christians cherish one another as brothers and sisters in the Lord. Love. The Greek word used here is agape, or the highest form of love. This is the same type of love that God has for us. The purest, most selfless love that has ever existed. This is the final and most difficult step in our process of spiritual growth. We must learn to view others through the eyes of Jesus and love them with His love. Why Are These Steps of Spiritual Growth Important? Peter not only gives us these eight steps for spiritual growth, but he also adds an explanation before and after this particular passage on the "why" of their importance. Here are six reasons why he considers these steps important in our walk with the Lord. To share in the divine nature (v. 4). The goal of every Christian should be to become more like Jesus each and every day. At the point of salvation, we were given the Holy Spirit who dwells within us. We are able to share God's divine nature as a result of the Holy Spirit's power. To escape the corruption of the world (v. 4). When we are focused on spiritual growth, we take our eyes off of the lust of the flesh, lust of the eyes, and the pride of life. Our focus is on the Lord and how we can become more like Him. To avoid laziness and unfruitfulness (v. 8). The point of salvation is not to wait around in a lazy state for His return. God wants us to lead fruitful, productive lives for His Kingdom purposes. We can accomplish this through purposeful spiritual growth. To remember our cleansing from sin (v. 9). In this verse, Peter states that those who lack the above qualities of spiritual growth have been blinded and have forgotten that they have been cleansed from their sin. To confirm your calling and election into God's family (v. 10). Living a Godly, productive life is evidence of our salvation. This in no way saves us, but demonstrates to the world that we are His children. To avoid sinning (v. 10). When you are working on these eight steps for spiritual growth, it becomes more difficult to live in a fleshly, worldly state. We avoid sin because we are attempting to live lives that are pleasing to the Father. Where are you at today in your journey through these eight steps of spiritual growth? In what areas do you need add to your faith?